Here we have collected frequently asked questions and answers. If you can not find the answer to your questions, please feel free to contact us. Your body produces its own heat. Whether you sweat or freeze depends both on the temperature in the room and on you yourself. We experience hot and cold in different ways. Down is a unique natural material that breathes and retains just the right amount of heat, yet releases the excess. That’s why we fill all our pillows and duvets with weightless down. Almost like small, fluffy clouds. Different types of down create different feelings. Geese live longer than ducks, and therefore make larger and fluffier down. The musk duck’s down has qualities that resemble eider down. And the Eider… It provides the world’s finest and lightest down. Simply put: Different feelings. Large down provides better insulating capacity than smaller down and has higher fill power or “fluffiness”. 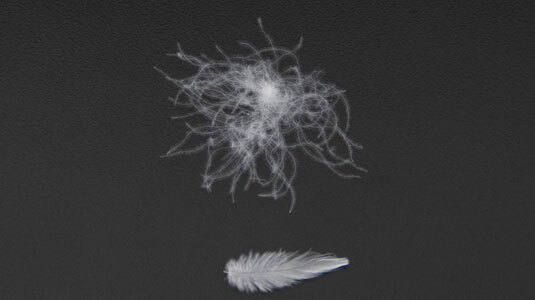 Feathers do not insulate as well, but provide good consistency as filling in pillows. Which down we use plays a significant role in your blanket or pillow. That’s why we only use the best. At our feather wash, we have complete control over the entire process, and can guarantee that your blanket is 100% in accordance with the declaration on the label. Down is the world’s best insulating material, and a large and fluffy down insulates better than a small and flat feather. In trade jargon this insulating capacity is called ”fill power”, and this is where down distinguishes itself from other materials. The larger the proportion of down, the higher the fill power. This means that a down blanket always has higher fill power (better insulating capacity) than a blanket with feathers or some synthetic material. A genuine down blanket must contain at least 51% down. Ours contain up to 100%. We use several different certificates so that you can be certain that we maintain the high quality we demand. We cooperate with several independent control organisations to maintain our established goals for sustainability, environment and animal welfare. Best Quality (Free of Chemicals) (ÖkoTex Standard 100, Class 1). Completely clean down (Downafresh, EN 12935). All our duvets and pillows retain their fluffy feel for many years, but they always do best with some fresh air. So air them as often as you can, by all means every morning. Then the down will redistribute itself and feel as light and wonderful as usual. Year after year. How do I store my duvet or pillow? Always wash your blanket before you store it for the winter (or vice versa). Store it in a dry, well-ventilated space. Always avoid plastic packaging, and never vacuum pack. Also make sure that it is completely dry when you store it. Then it will be nice and fresh when you want to use it again. We believe that the ducks and geese that enable us to sleep more soundly should live a good life. This is important. Therefore, each and every down we use is traceable, which gives us full control over its handling (including washing, sterilisation and sorting). According to current EU rules, of course. We only use down from Europe, and comply with the EU’s strictest animal protection laws. Our traceability system always documents the down’s origin, where we purchased it and how the transport was conducted. We always meet the strict requirements demanded of our production through our cooperation with external monitoring organisations. By all means, ask us if you have any questions. The EU’s animal protection laws are the strictest in the world. With the various certificates that ensure how the animals are handled, you can be sure that our down is never plucked from living animals and that they are treated well during their lifetime. We are members in the Business Social Compliance Initiative (BSCI), an organisation that works to improve working conditions and sustainability processes with companies in Europe. We actively contribute in the fight against child labour, against discrimination in the workplace, for better working conditions and for sustainable production. Our duvets last longer. If you take care of your down duvet, it may actually last for many years.